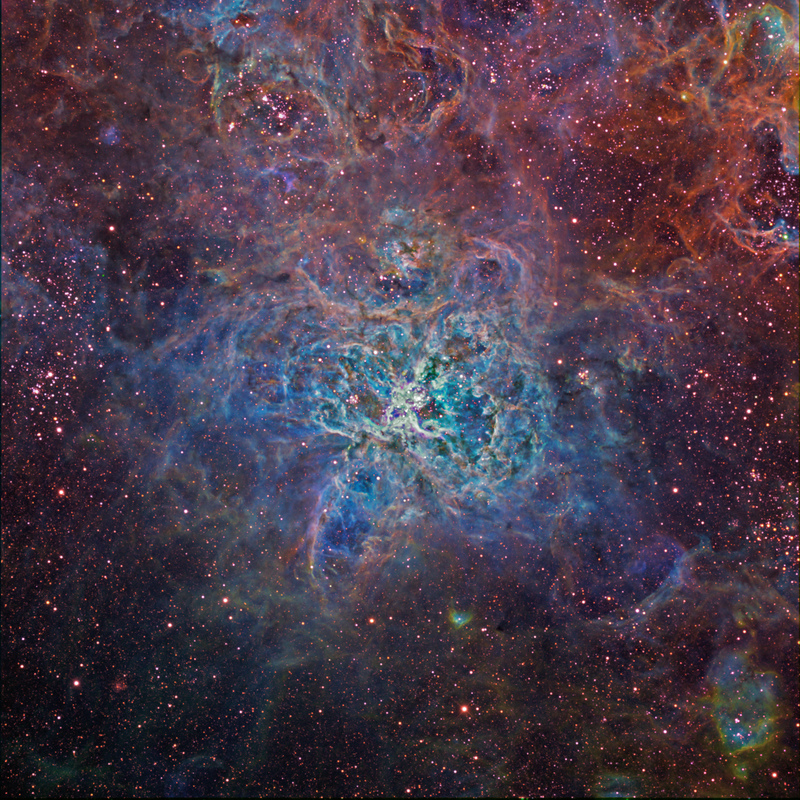 The Tarantula Nebula is an incredibly bright emission nebula located in the Large Magellanic Cloud (LMC) in the southern constellation of Dorado with an apparent magnitude of +8 at a distance of 160,000 light years. It is huge, being nearly 640 light years across. 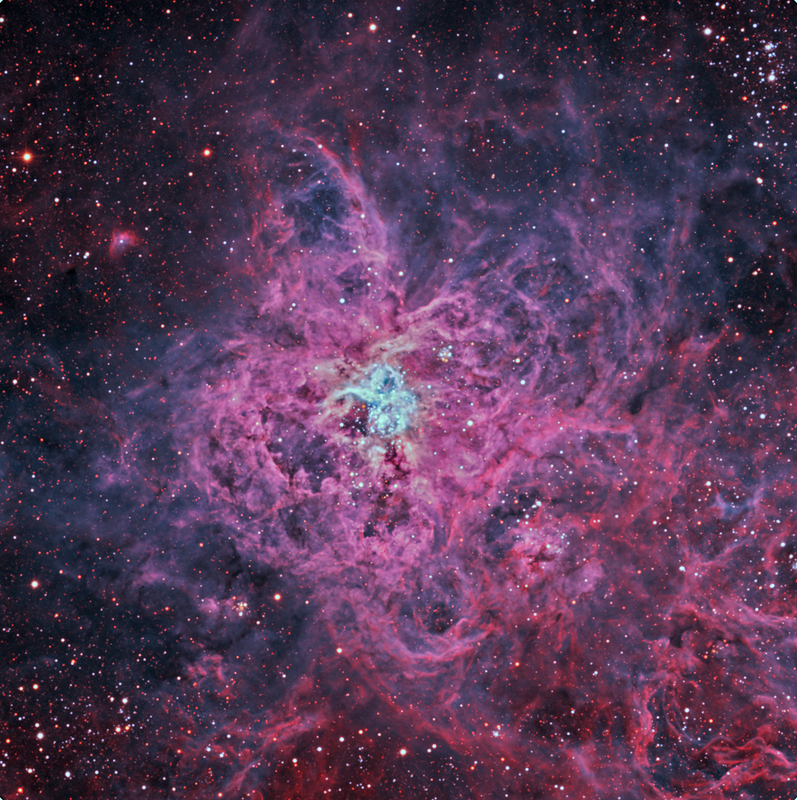 It is also known as 30 Doradus, Caldwell 103 and NGC 2070. It is the most active region of star formation in our local group of galaxies. This image is a bit larger than 1/2 degree square. North is to the lower left. Supernova 1987A occurred at the edge of the Tarantula. This image shows the incredibly intricate and varied structure from the use of narrowband filters that significantly increase structural contrast. Similar to the Hubble Space Telescope’s (HST) "Pillars of Creation", this is a false color image, where hydrogen (H-a), oxygen (OIII) and sulfur (SII) emissions are color-mapped to green, blue and red, respectively. For comparison, I’ve remapped the color to represent "natural" color in the image below which has been cropped and rotated to the conventional north being up. This version would be closer to what would be obtained with RGB filters, except the detail is much greater using narrowband filters.